HBO has issued a sneak peek at season two of Big Little Lies. It's almost time to head back to Monterey. 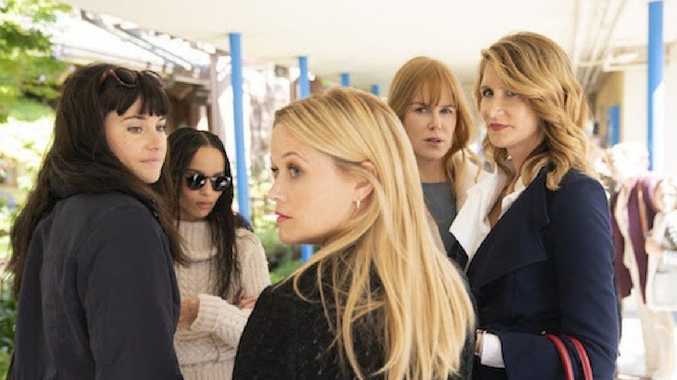 HBO has finally revealed when the highly anticipated second season of Big Little Lies will hit our screens - and offered up a little peek at what's to come. The tweet, posted late on Friday, shows BLL's core cast - Reese Witherspoon as Madeline, Nicole Kidman as Celeste, Shailene Woodley as Jane, Zoe Kravitz as Bonnie, and Laura Dern as Renata - looking over their shoulders with concerned expressions. HBO also confirmed that the new episodes will premiere in June. Notably, we were introduced to Perry's mum, a new character played by Meryl Streep, who is demanding answers about the death of her son (Alexander Skarsgard). It appears she is speaking with Reese Witherspoon's character Madeline, but this could just be tricky editing. This was the night the group of women fought back against Celeste's violent husband Perry, knocking him down a flight of stairs, killing him. We also left off on quite an ominous scene, with the ladies looking fearful as their kids play on the beach as detective Adrienne Quinlan (Merrin Dungey), who had been investigating Perry's death, watched them from a distance.